All the moments of your day are teachings. If you look at them clearly, you’ll see the same fundamental truths the Buddha did. All our actions, even our choice of livelihood, should meet the criteria of kind intent. Committing to that intent involves wise mindfulness, the precision in the mind to notice the motives that precede actions, and wise concentration, the steadiness in the mind that makes it less likely to become confused. Wise effort is the resolve, at every choice-point, word, or deed, to discern and choose wholesome actions. Wise understanding is our deepening conviction that peace of mind, and the natural goodwill and compassion that grows from it, depends on wholesome choices. Wise intention is our ever-renewing dedication to all the practices that promote these wholesome choices. Daily life is practice. Because life in the world is as complex as it is, it is the optimal setting for developing the capacity of equanimity and the habit of benevolence. The techniques that we learn in classes and retreats are techniques for living life. 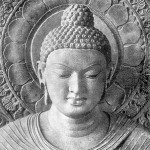 The Buddha began his spiritual quest hoping to discover the answer to the suffering of regular people. He did and we are the beneficiaries of his example. For now we know that we too can wake up to the unconscious habits of our minds and transform them, through wisdom, into compassion.